The panicked look on my face probably startled my husband into thinking something dire had taken place. Truthfully, for the first few seconds after I realized the stuffed shells recipe I was following seemed to have omitted the ricotta…well, I did have a minor momentary freakout. It shouldn’t have been a real showstopper, but when I’m racing against the sun to prepare and photograph a meal before putting it on the dinner table, the last thing I want to find out is that the recipe I’m following has flaws. Sometimes when you find one error in a recipe, others aren’t far behind. I scanned over the recipe again and again, but there was no mention of ricotta cheese at all. Impossible! Stuffed shells are made with ricotta, or at least the kind I like to eat do. I wondered if I had mistakenly chosen a sausage-and-spinach-only version, but the photo on the side of the box where I found the recipe depicted shells just brimming with spinach-flecked ricotta. It was definitely supposed to be in there. Fortunately, this recipe error seemed to be an isolated incident. Hoping I wouldn’t wind up with way too much filling I went ahead and added in a pound of ricotta anyway. I just couldn’t bear to make stuffed shells without it. They turned out just right – that classic, homey comfort dish I’ve known and loved for years, made a little healthier with a bag of baby spinach mixed in. And ricotta. Problem averted. 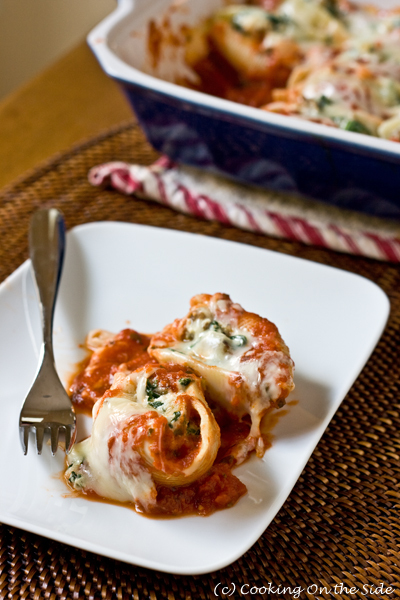 Adapted from the Stuffed Jumbo Shells recipe on the back of the Barilla Jumbo Shells package. Cook jumbo shells according to package directions; drain, reserving 1/3 cup of the pasta cooking water. Meanwhile, cook Italian sausage in a large skillet over medium-high heat 7-10 minutes or until no longer pink, stirring occasionally. Drain grease. Add oil, spinach, onion, garlic, reserved pasta water; continue cooking 10 minutes, stirring occasionally. Remove from heat. Add seasonings and blend well. Let mixture cool. Combine egg, ricotta and Parmigiano cheese in a large bowl. Mix in sausage mixture. Pour 1 cup of the marinara sauce into a 13×9 inch baking dish. 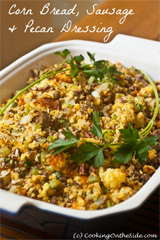 Fill jumbo shells with meat and cheese mixture; place in dish. 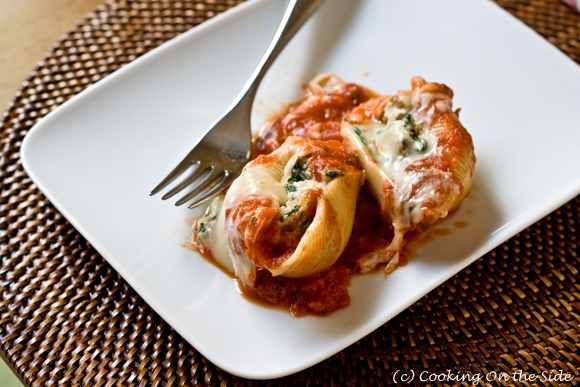 Pour remaining sauce over shells; sprinkle mozzarella cheese over the top, cover with foil. (If you have more filled shells than will fit in your baking dish, you can always freeze the extra). Bake for 30 minutes or until thoroughly heated. I love stuffed shells. 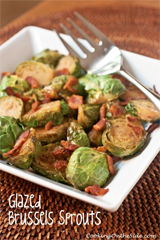 They are one of those classic comfort foods that make you feel warm from the inside out, and yours look perfect. Stuffed shells is one of my favorites too. Yours look scrumptious. Definitely needs ricotta! I loved stuffed shells, but now I love them even more. Well done. I hate my diet. Is there a way to feed back to Barilla that their recipe is wrong? That’s probably a good idea, Nate – maybe I’ll see if they have a feedback email address somewhere. Made these tonight for some friends that were coming over for dinner and they were a huge hit! Delicious! Fantastic – that’s great to hear, Kristin! Thank you for coming to my rescue! My freak out moment after reading the recipe on the back of the box was no specific amount of reserved pasta water. I didnt even realize the ricotta cheese snafoo. I can’t wait to try your version tonight. It looks incredible! So, I do love this recipe off the box, without the ricotta. I dont cook with ricotta and we like it with out. Here is my problem, we want to make the recipe…but the back of the box changed…and the last time we cooked it it must have been so good that we ate the box. I had torn the recipe off, but it disappeared. Do you have the recipe with out the ricotta? Please help!! 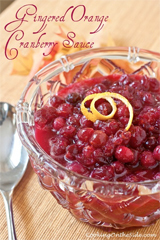 Does anybody know how many servings are in this recipe? It’s about 8 servings, I’d say. The recipe is fine, but the print is so small thart it is VERY difficult to use; it coulc be made larger and still fit on one page.. Previous post: Brownie-Swirled Chocolate Chip Cookies + Baking Giveaway!